Obviously, dogs can’t eat walnuts as walnuts contain the toxin. Walnuts contain a toxin named tremorgenic mycotoxins can cause seizures. In fact, fresh walnuts don’t contain this toxin, only produce this toxin after they get wet. It’s difficult to know whether the walnuts were exposed to moisture, so it would be wise to keep your dogs away from walnuts. Walnuts contain too much fat content can cause your dogs gastrointestinal issues and increase the risk of pancreatitis. Beyond that, it’s too much trouble to crash the walnuts and remove shell. 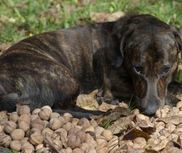 If dogs eat the walnut shells, can cause a stomach ache and diarrhea. You should be sure preserve walnuts in a sealed container, keep walnuts far away from your dogs. If you accidently drop some walnuts on the floor, you should immediately clear them to prevent your dogs eat them. Walnut is toxic for your dogs, If your dogs appear walnut poisoning symptoms such as vomiting, anorexia, trembling, lethargy, call your vets as soon as possible.